Four-time Grammy nominated Natalie Grant is a top-selling Christian & Gospel artist with over 3 million in career sales. The Gospel Music Association has named her Female Vocalist of the Year 5 times and she has had multiple number 1s on the Billboard charts. Beyond music, in 2005 Natalie co-founded Hope for Justice International, an organization that identifies, rescues, and restores victims of human trafficking. Natalie resides in Nashville, TN with her husband, producer/songwriter Bernie Herms and their three children: twins Grace and Bella, and their youngest, Sadie. A Dolphin Wish by Natalie Grant is an absolutely wonderful book! My daughter is eight and couldn't put this book down. She loves animals so I knew she'd love this book. Mia, the little girl in the book also has two sisters just like my daughter so she definitely could relate to her. I love the story line in this book and love that it's all about a young girls adventure. I also love that there's a faith based lesson to be learned and that it's written by the famous Natalie Grant. 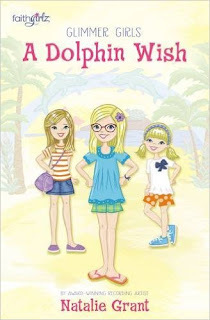 A Dolphin Wish by Natalie Grant is an extremely fun book and I highly recommend it! You can find A Dolphin Wish by Natalie Grant on Amazon, Barnes and Noble and other bookstores.